2. Cadets who wish to participate in an air rifle range practice and/or attempt to qualify for a marksmanship badge are encouraged to sign up for a Thursday night range practice. Cadets can sign up with Capt Frampton. Range will be held every Thursday night up to and including Thursday, May 15, 2013 A Merit Review Board is scheduled for this Saturday, April 12, 2014 at the Pembroke Armoury for all Flight Sergeants seeking promotion to Warrant Officer Second Class. Lt Bing is the chairperson. 3. 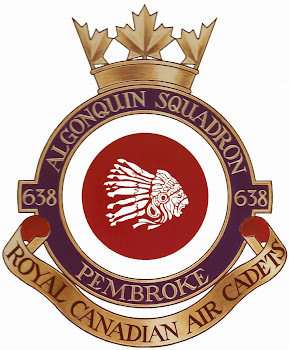 A Merit Review Board is scheduled for this Saturday, April 12, 2014 at the Pembroke Armoury for all Flight Sergeants seeking promotion to Warrant Officer Second Class. Lt Bing is the chairperson. 4. There will be a special drill team practice this Saturday, April 12, 2014 at the Armoury. The practice will take place from 1000hrs to 1400hrs. Cadets should bring their lunch, water bottle, and any nut free snacks they may require. Cadets will be permitted to go to Pizza Pizza only if they prefer to bring money for lunch. Drill boots and wedges are mandatory. 7. Cadets are to see the Supply Officer (OCdt Alex McGinley) to sign for their name tags. 8. Some offers of participation for summer training have been received at the Squadron. As we receive them we will make cadets aware of what courses they have been selected for. Congratulations to FSgt Brennan Frampton who has been selected for the Power Pilot Scholarship Course and Sgt Shanon Rochat and Sgt Eric Fleurant who have been selected for the Glider Pilot Scholarship Course.